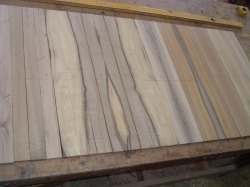 Textures vary as the wood is steamed, sanded and finished. 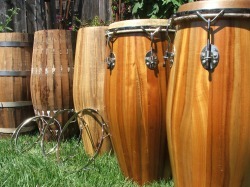 Here are several stages of the drums after being steamed and shaped. You can see the dried wood before turning on the lathe. Peter also makes all the hardware by hand, including the rims and distinctive side plates. 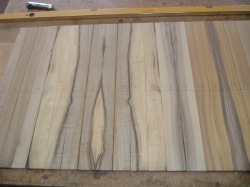 Notice the dramatic figuring in the wood that form patterns. 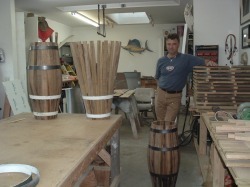 He selects each stave individually to create distinct designs. Peter matches wood grain to attain a specific grain appearance.